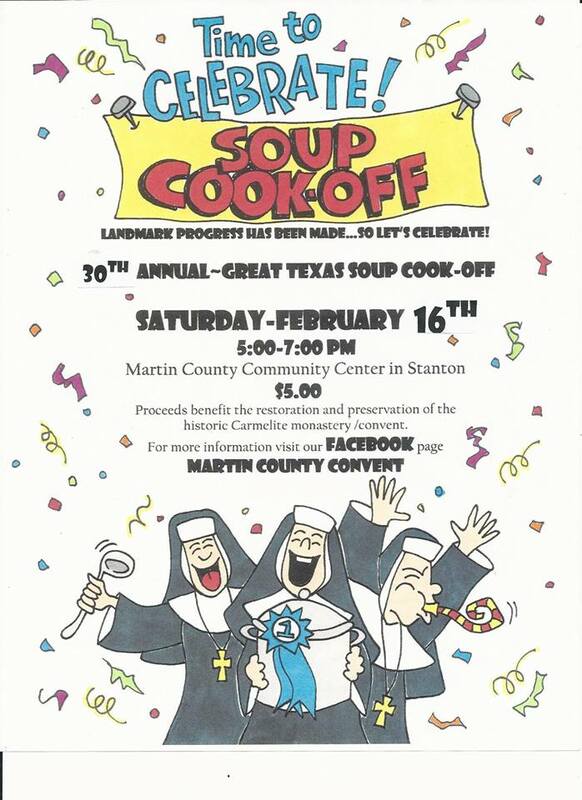 The 30th Annual Great Texas Soup Cook-Off takes place on February 16th from 5-7 PM at the Martin County Community Center in Stanton. This is an annual event for the restoration of the 1884 Historic Carmelite Monastery in Stanton. The Soup Cook-Off is a chance to taste soups made by local chefs and an opportunity to vote for your favorite entry. Children are always welcome with activities of face painting and a balloon artist. Contact Reggie Baker at 432.553.0693 for more information. Download the Soup Cook-Off entry form here.